If you Google these words and start clicking on links, you get lost in the vast number of web sites, blogs, articles, videos, and statistics all across the Internet devoted to this comparison. Who is better, musically? Who is more artistic? Who has been more influential? Who has been more successful in business? Who has the better logo? Who would you rather be? Oh, and about which band did my Dad say, “That’s not music, that’s crap!”? 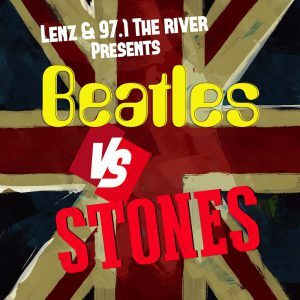 It’s a classic rivalry, created mainly by the fans of the bands, which Lenz is exploring musically on Friday, December 13 at The Loft in Midtown. I strongly recommend you save the date and come out, because it is going to be a night to remember. As chairman of the advisory board for the non-profit, Poverty is Real (PIR), I try to get to as many of the benefit shows that PIR puts on as possible. Not only is it for a great cause, but I also get to hear bands I might not be exposed to otherwise. Recently, PIR organized a Dylan-themed show, which turned out to be one of the best nights musically that I have ever experienced. My daughters Laura, who was 13, Claire, who was 17, and my Dad, who was 82, were there that night and all had a blast hearing the songs of Dylan interpreted by a wide range of artists, including my daughter Kristen, who blew the crowd away. People in the audience were buzzing about the night many weeks later. So that got me thinking: what could Lenz do to try to match it as a fundraiser for PIR? When a friend suggested Beatles vs Stones, I had what I call a “Homer Simpson moment” … Doh! Why hadn’t I thought of that? Special thanks to the many sponsors of the event: 97.1 The River, Paste magazine, Red Eye Gravy Records, The AJC Decatur Book Festival, Decatur CD, ML Healthcare, and Carmichael, Brasher, Tuvell & Company. Tickets can be purchased at the event web site — BeatlesvStones.com — where you can also follow the many special artist and promotional announcements that are coming. Oh, and my Dad? He was talking about the Beatles! And I’m hoping he turns out again for another great night of music …you can argue with him there about the Fab Four! Lenz Marketing offers clients the full suite of marketing and communication tools to grow their businesses. At Lenz, integrated marketing is the strategic and coordinated implementation of digital and traditional advertising, PR, web sites, social media, and events to achieve a stated goal.